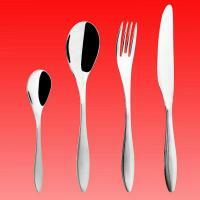 Cutlery Flatware Set | KEJ-405(KEJ-405) - Keywood International Inc. This cutlery set is designed with protruding handles before tapering off near the end. The added bulk is elegant yet functional.